Silver Spring, Md. (April 10, 2019) – To turn awareness into action this Alcohol Responsibility Month, Responsibility.org’s Ask, Listen, Learn: Kids and Alcohol Don’t Mix program, the most widely-distributed underage drinking prevention program of its kind, and Discovery Education, the leading provider of standards-aligned digital curriculum resources, engaging content, and professional learning for K-12 classrooms, today announced a new partnership aimed at educating students about the negative effects of underage drinking on the developing brain. To kickoff conversations in classrooms nationwide around this topic, Ask, Listen, Learn and Discovery Education will be hosting a Digital Discussion on the Science and Impact of Alcohol on Developing Brains, Bodies, and Behavior – a day of online engagement dedicated to equipping students in grades 5-7 with the knowledge and tools to say “YES” to a healthy lifestyle and “NO” to underage drinking by releasing a series of new lesson plans and videos for the classroom. On April 11, follow #BrainBodyBehavior on Twitter as teachers, school nurses, school counselors, and other subject-matter-experts discuss how to teach kids about the impacts of underage drinking on their developing brains, bodies, and behavior. A portion of the day will be dedicated to unveiling three digital, no-cost, standards-aligned lesson plans, a family resource guide, and three corresponding videos featuring five-time gold medalist swimmer, >Nathan Adrian. Experts including Responsibility.org Educational Advisory Board member and founder of the blog Tech Savvy Mama Leticia Barr, school counselor and author of the book Middle School Matters Phyllis Fagell, Discovery Education’s STEM expert Cindy Moss, educators and athletes from Classroom Champions – including co-founder and three time Olympian Steve Mesler – and a team of Ask, Listen, Learn Ambassadors will lend their voices to discuss this new content and engage with educators and students in real-time. Educators are encouraged to share photos and videos of their class or ask experts their questions about how to talk to kids about living a healthy lifestyle using #BrainBodyBehavior. 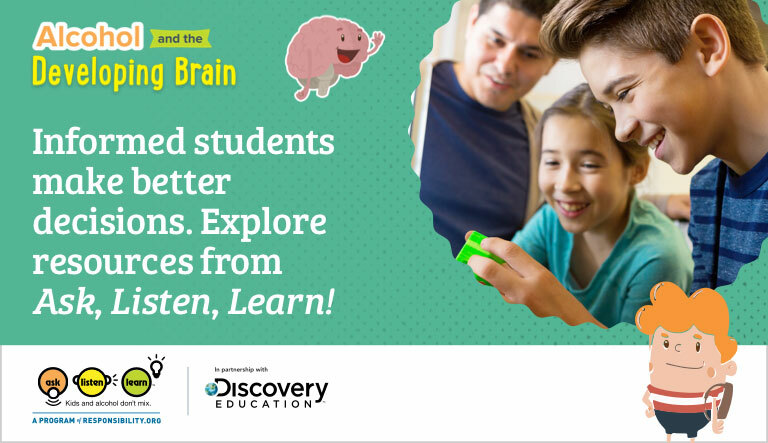 Be the first to explore these new, no-cost resources from Ask, Listen, Learn in partnership with Discovery Education at DiscoverBrainBodyBehavior.com. Ask, Listen, Learn: Kids and Alcohol Don’t Mix, the underage drinking prevention program for kids ages 9-12 from Responsibility.org, provides free, evidence-based and standards-aligned lesson plans for educators. The program utilizes innovative science lessons and videos to teach kids what the brain does, what alcohol does to it, and what that can do to them. The program’s skills-based approach teaches kids about communication, decision-making, accessing appropriate resources, and advocating for themselves and their peers. Ask, Listen, Learn also has a suite of resources for parents to use to start conversations at home to prevent underage drinking. Prevention specialists, educators and parents play a critical role in empowering students by giving them the confidence kids need to say “NO” to drinking underage. Since 2003, underage drinking has declined 50% (Monitoring the Future, 2016), and conversations between parents and their kids about alcohol have increased 73% (Responsibility.org, 2016). All of the Ask, Listen, Learn resources are accessible for free at asklistenlearn.org. For more information about the Ask, Listen, Learn: Kids and Alcohol Don’t Mix program, visit asklistenlearn.org. Stay connected with Ask, Listen, Learn through social media on Facebook, Twitter, Instagram, and Pinterest, and Responsibility.org on Facebook, Twitter and Instagram. For more information about Discovery Education’s digital curriculum content and professional development services, visit discoveryeducation.com. Stay connected with Discovery Education through social media on Facebook, Twitter, Instagram and Pinterest @DiscoveryEd. Ask, Listen, Learn is the most widely-distributed underage drinking prevention program of its kind. Developed and distributed by Responsibility.org, founded by distillers, and recognizing more than a decade of success, the program has innovative, science and evidence-based digital resources for teachers, counselors, school nurses and other educators that teach kids about what the brain does, what alcohol does to it, and what THAT does to you. The program also includes resources for parents, such as conversation starters and tips, to help kids say YES to a healthy lifestyle and NO to underage drinking. For more information, visit AskListenLearn.org.